For its 75th anniversary, Jaguar's unveiling the C-X75 Concept, an extended-range electric coupe showing off a new design direction for the leaping-kitty brand, along with a electric/gas turbine power source generating 780 hp. Your 21st century British supercar awaits. Designed with the intent to move Jaguar's styling into something new and evolved, the C-X75 revives the promise of the XJ220 two-seat supercar from the 1990s; one vehicle that carriers every engineering resource Jaguar can muster. The C-X75's design mixes a number of cues from Jaguar's modern lineup, but in shape and proportion resembles the 1966 XJ13 Le Mans prototype, a car Jaguar chief designer Ian Callum tags as "possibly the most beautiful Jaguar ever made." But there's no precedent in Jaguar history for the powertrain under its aluminum skin. 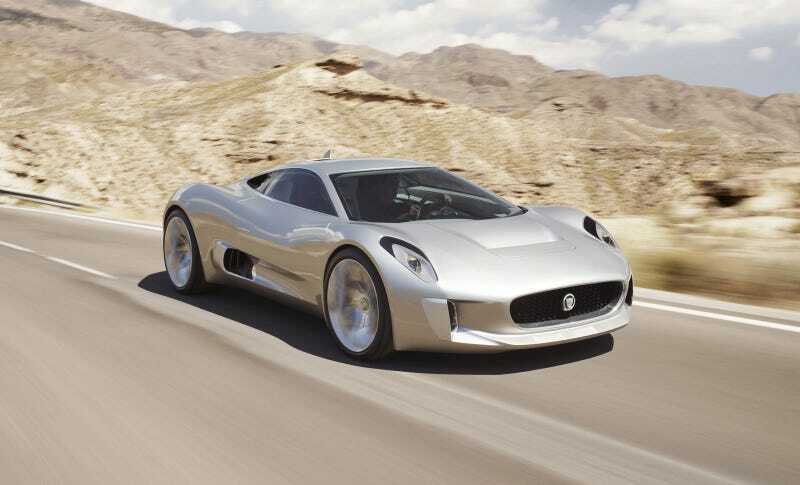 Using four electric motors at each wheel generating 195hp each and a lithium-ion battery pack, Jaguar says the C-X75 can hit 62 mph in 3.4 seconds, with a 10.3-second dispatch of a quarter mile. The batteries carry enough energy to carry the two-seater 68 miles on electric power alone. And when those dim, the C-X75 can refill its electric power with two micro gas turbines, paired midships, that generate 94 hp apiece, providing nearly 500 miles of additional range. The turbines can operate independently, and can be called upon to directly power the electric motors. Yoked together, the system provides 780 hp and 1187 lb.-ft. of torque to all four wheels. Aside from aesthetics, the designers needed to deal with the forces require to keep the C-X75 stable at an estimated top speed of 205 mph. The scoops on the side feed the gas turbines, which need 25,000 liters of air per minute in operation. The exhaust gases from the turbines feed into the aerodynamics as well. In the cabin, Jaguar has designed a series of new touchscreens, including one that can mimic the dash of a D-Type. The center dash also sports a Bremont-designed clock, and instead of speakers, the Bowers & Wilkins sound system uses transducers lining the doors and bulkhead in a honeycomb pattern, creating a system that can actively cancel some of the noise from the mini jet engines behind the passengers' spines. For three-quarters of a century, Jaguar has embodied the highs and lows of Britain's auto industry. Left for dead several times, Jaguar has struggled into a semblance of financial stability following its sale by Ford to India's Tata Motors in 2008. But it has shied from made an overarching statement of purpose about its future under new ownership until now. If it can put some of the C-X75's technological bounty into a real vehicle, Jaguar could craft a few more years as glorious as any from the previous 75.